The University of Michigan Law School was founded in 1859 and enrolls only about 1,200 students. The school offers JD, LL.M, and Doctor of Juridical Science programs. The school currently has 81 full-time faculty members. From the graduating class of 2010, at least 92.5 percent students were employed by the 250 largest firms of the nation. Michigan Law School has been among the top law schools of the nation with consistence. In the first U.S. News & World Report law school rankings published in 1987, it was ranked third, only below Yale and Harvard. It is one of seven schools which has never failed to be within the top 10 law schools as ranked by U.S. News & World Report. In the 2012 rankings, Michigan Law has ranked 10th overall. For international law it has the 6th position. In 2011, a U.S. News reputational ranking of law schools by hiring partners and top law firms of the nation ranked Michigan Law as the 4th in U.S. Only three law schools have given more Supreme Court Judges to the nation than Michigan Law, - Yale, Harvard and Columbia. However, Michigan Law has placed more Supreme Court Law Clerks than any other public law school in the nation. Michigan Law School also was featured in a list of top law schools analyzed and ranked by LawCrossing CEO Harrison Barnes. This list can be found here: Top Law Schools Analyzed and Ranked by America's Top Legal Recruiter. Admissions are highly selective as expected, and only eighteen percent of applicants are accepted at Michigan Law. The application fee is $60 and there are provisions for both merit-based and need-based fee waivers. The admissions process is diversity oriented. In 2003, the Supreme Court upheld the admissions process at Michigan Law which considered race as one of the many factors for selection, however race is no more a consideration in line with constitutional amendments in Michigan. Like other law schools, the early bird gets the worm, and most applications are submitted before the middle of January. Rather than an inflated personal statement, Michigan likes to-the-point personal statements from applicants, but makes up for the lack of space by providing the option of submitting optional essays. Class rankings and grades are transparent and formalized. In first-year courses and all upper-level courses with 40 or more students the mean GPA is obtained from the Registrar’s Office and counted along with final grades. The target mean range of the mean GPA is between 3.13 and 3.25. Any deviation needs a letter from the Associate Dean to justify the deviation. Such standards are not mandatory in upper-level courses where there are fewer than 40 students. There is no formal seminar grading practice and they are more lenient than course grades, ranging between a B+ and an A+, while in normal first-year courses, the guidelines are for aggregate A+, A, and A- grades – any departure needs to be justified by unusual circumstances of a particular class. In calculating individual grades, rounding to the nearest whole number is practiced. So, in theory, every student can end up with 4 A+’s once things are rounded off. Graduate student status is held irrelevant for the determination of grades for course work and research work, and graduate students are amenable to the same substantive standards as for J.D. students. The “Order of the Coif” requires a minimum of 62 credit hours in courses at the Law School which are fully graded and factored into their honor point average. As in other big law schools, externships at the Michigan Law School is conducted under the guidance of a faculty sponsor and an attorney supervisor. 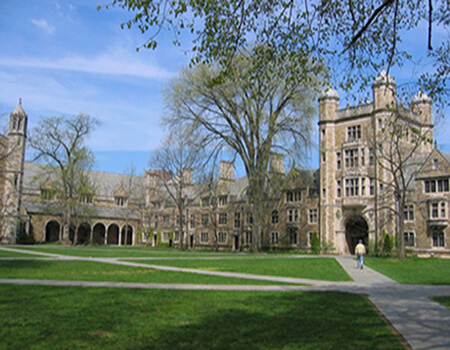 Externships offer valuable learning opportunities and the University of Michigan Law School works with nonprofits and agencies like the Institute for Justice, Asian Pacific Islander Legal Outreach, the Food and Drug Administration, the Human Rights Law Network in India and the Financial Action Task Force in France. The Michigan Law School also has special externships in other countries including externships in Geneva and South Africa. Students who are interested in externships nee to attend externship interest meetings that are held at the beginning of each semester. Externship rules in the University of Michigan Law School include mandates that the student may not accept any payment for work done during the externship, but may accept reasonable out-of-pocket expense reimbursement. Externships are not allowed with any organization that works for profit or with a court as in judicial clerkship. The University of Michigan School of law supports paid internships and other supplementary financial support to students. Internships are available in different programs like the Cambodian and Refugee Law Programs and the Aire Centre, London. Americorps National Service, Armenian Assembly of America (summer internship), The Baseball Hall of Fame (The Frank and Peggy Steele Internship Program), The Congressional Black Caucus Foundation Inc. (CBCF Congressional Internship Program – Summer Term), Michael Curry Internship Program, Federal Communications Bar Association Foundation (FCBA), Institute for Educational Equity & Opportunity ( IFEEO Summer Associate Award), Luce Scholars Program, The Robert Masur Fellowship for Civil Liberties (Robert Masur Fellowship), National Lawyers Guild Summer Internships, Morris K. Udall Foundation (Native American Congressional Internship Program), Washington College of Law (Washington, D.C. Summer Programs), and others. As, the Michigan Law School declares on its website clinical programs mean “Real-world experience with real impact.” For more than 30 years the Michigan School of Law has been offering clinical programs across a wide array of topics. The law school offers 14 clinics and student enrollment has doubled in the programs over the past five years. Clinical programs offer great opportunities for interdisciplinary and cross-border experience enriching students with better and broader perspectives of the application of law. The clinics also help to build greater public service commitments in students. Current clinical programs of the Michigan School of Law include: The Child Advocacy Law Clinic, The Community and Economic Development Clinic, The Criminal Appellate Practice Clinic, The Entrepreneurship Clinic, The Environmental Law Clinic, The Federal Appellate Litigation Clinic, The General Clinic, The Human Trafficking Clinic, The Juvenile Justice Clinic, The International Transactions Clinic, The Low Income Taxpayer Clinic, The Mediation Clinic, The Michigan Innocence Clinic, and the Pediatric Advocacy Initiative. At the University of Michigan School of Law, moot courts are open to both second and third-year students. First year students have instead of moot courts, one oral appellate argument and brief as part of the Legal Practice class. There are a number of moot court competitions to prepare students better for public speaking and submission of arguments. Current moot court competitions held by the Michigan School of Law include the Campbell Competition, the Child Welfare Law Moot Court Competition, the Criminal Law moot court competition, the Intellectual Property Moot Court Competition, the Jessup International Law Moot Court Competition, the Native American Law Students Association Competition and competitions in other areas of law like Environmental law and Entertainment Media and Arts. The University of Michigan Law School encourages students to pick up and develop their logical and writing skills and conducts regular and provisional law journals as platforms for student thought and expression. Regular journals at the Michigan School of Law include the Michigan Law Review, the University of Michigan Journal of Law Reform, the Michigan Journal of International Law, the Michigan Journal of Gender & Law, the Michigan Journal of Race & Law, and the Michigan Telecommunications and Technology Law Review. Provisional journals supported by the law school include the Michigan Journal of Environmental and Administrative Law and the Michigan Journal of Private Equity & Venture Capital Law. Ronald J. Allen (J.D. 1973), Northwestern University John Henry Wigmore Professor of Law, one of only four Americans to be designated as a Yangtze River Scholar (China's highest academic award, which was formerly only for Nobel Laureates) in 2007. Allen is the first law professor to receive the award, which usually goes to scientists or economists. Edgardo Angara (LLM 1964), former president of the University of the Philippines and Senate President of the Philippines. Susanne Baer, (LLM 1993) was elected to the German Federal Constitutional Court in February 2011. Willard Lee Boyd (LAW: LL.M. 1952;S.J.D. in 1962) President Emeritus of The University of Iowa having served as its 15th President. He served as Chairman of the Association of American Universities (AAU) from 1979 to 1980. Jay Gorney (LL.B. 1919), Tin Pan Alley songwriter who co-wrote Brother, Can You Spare a Dime? ; blacklisted during McCarthy era. Teresita J. Herbosa (M.C.L. 1980) appointed, in 2011, as the new chairperson of the Securities and Exchange Commission (SEC) of the Philippines. Prior to her appointment to the corporate regulator, Herbosa, 60, was a senior partner at the Angara Abello Concepcion Regala & Cruz Law Office (ACCRA). Eric Paul Lefkofsky (J.D. 1993) (born September, 1969) is a U.S.-born serial entrepreneur. An Angel investor in Groupon, he is currently president of Blue Media, LLC, a Chicago-based private equity and consulting firm. He was named, in 2011, to Forbes list of billionaires. Branch Rickey (LL.B. 1911), Major League Baseball executive and Hall of Famer; created the modern minor league system and signed Jackie Robinson to a contract, breaking the sport's 20th-century color line. John C.H. Wu (J.D. 1928), the principal author of the constitution of the Republic of China. The Law School South Hall academic building at the University of Michigan Ann Arbor has been awarded the LEED Gold certification. LEED stands for Leadership in Energy and Environmental Design and is an internationally recognized certificate of sustainable green building design. Awarded by the U.S. Green Building Council, the LEED certification means that the Law School South Hall building passes the highest international benchmarks in measurable green building design, construction, maintenance and operations. Sarah Bullard, one of the students who graduated in 2010 and were among the students who actively engaged in the sustainability project and urged the school to seek LEED certification told the media, “All along, we wanted to make sure the new building was beautiful but also sustainable, and for the Law School to be mindful of its impact, … and I'm very happy that we were able to not just meet our goal of getting LEED certification, but to exceed it." Evan Caminker, the dean of the UM Law School said “We are very pleased by the LEED Gold certification, and also veryproud of how we went about achieving it … We wanted to make sure everything we were doing was sensibleand appropriate for the building, as well as sustainable. We made an effort to seek LEED points by doing only things that would work well for the building and the people who use and maintain it." The 100,000 square-feet building houses classrooms, clinical spaces, multi-purpose spaces and the offices of Law School faculty. The offices of many law school administrators are also housed in the building. The Law School building is the fourth building at the Ann Arbor campus to receive the LEED certification. The Samuel T. Dana building of the University of Michigan, Ann Arbor is also LEED Gold certified. LawCrossing is the best both in terms of quality and quantity. LawCrossing Fact #5: LawCrossing is updated multiple times daily, constantly bringing users brand-new jobs.